Almond Spritz Chocolate almonds Spritz Butter Spritz covered chocolate You hesitate ? You can take these three ! Almond Spritz : Butter and Almond Shortbread : wheat flour, 17.4% butter, sugar, 14% almonds, eggs, raising agents (disodium diphosphate, sodium hydrogen carbonate). 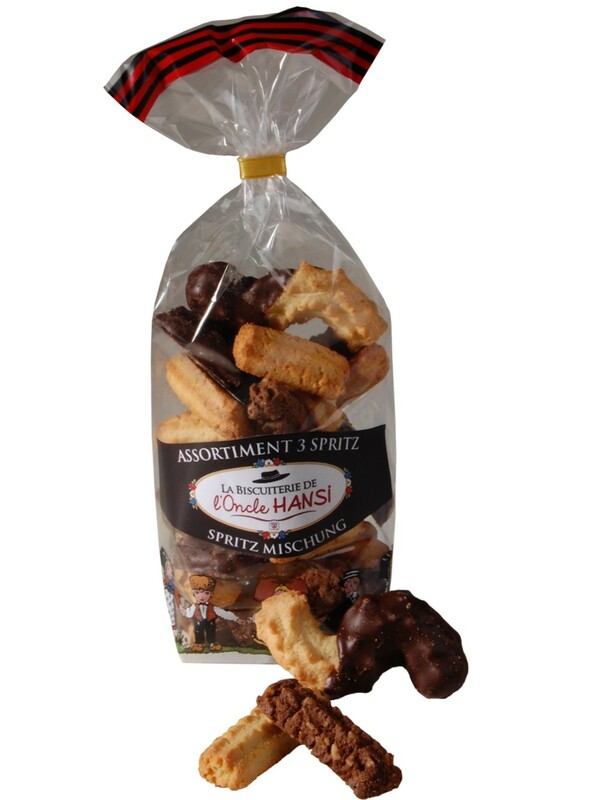 Chocolate almonds Spritz : Shortbread with almonds and chocolate chips : wheat flour, 16.4% almonds, sugar, butter, eggs, 8.4% chocolate chips (sugar, cocoa mass, cocoa butter, emulsifier: soy lecithin, vanillin), cocoa powder, raising agents (disodium diphosphate, sodium hydrogen carbonate). Butter Spritz covered chocolate : Butter biscuits covered with dark chocolate: wheat flour, 19% butter, 16% dark chocolate (cocoa mass, sugar, cocoa butter, emulsifier: soy lecithin, natural vanilla flavouring) , sugar, water, natural vanilla flavouring, raising agents (disodium diphosphate, sodium hydrogen carbonate), salt.